What does conversational technology mean for businesses in 2019? — Think. Plan. Thrive. At Think Plan Thrive, we’re fascinated by conversational tech. By the huge opportunities it brings to make marketing and customer service more human by interacting with people in the most intuitive way we know - through dialogue. We started playing with our own bots, and now run conversational sprint projects that help our clients quickly explore how their customers and businesses can benefit - before experimenting and prototyping ideas. We are all seeing customer behaviour and expectations changing. People valuing convenience and availability above all else. Expecting important information at their fingertips, 'on-demand’, wherever, whenever. The technology is accessible and cheaper than ever - to deliver great marketing experiences and customer service that delivers faster and more seamlessly than ever before. So why hasn’t it become mainstream? Voice-activated technology is still niche, and even the early adopters are only using devices for a few core functionalities. Chatbots are even less widely used. Pick your top ten brands. Go on to Facebook and try to communicate with them via their Messenger channel. I can guarantee than 9 out of 10, if not all, will be a terrible experience. We brought together curious minds with diverse perspectives on the topic, to discuss and debate the opportunities and challenges that surround conversational technology. Our group came from Taught by Humans, Project Kitchen Table, Marvel App, Shed Collective, WorldPay, Clinova - and our partners in all things chatbot - SnapOut. Big thanks to everyone who came along! Here’s what we chatted about. . .
Conversational tech went too big too fast. Companies built bots that didn’t just frustrate customers - they really freaked them out. They weren’t upfront about whether it was a bot or a person. They didn’t pay enough attention to really solving a problem, and so were often surplus to requirements. There are some extraordinary and quite extreme examples - most famously, Microsoft’s Twitter bot which became an extreme racist within 24 hours of being released to the world. On the less extreme side - the problem was that the hype led people to believe that bots were likely to be a replacement to apps. That apps could die and we would do everything through conversational platforms. In reality, there is a great deal that apps do really well that bots - certainly for the near future - can’t get close to. People are realising now that the most exciting opportunity is to use bots to extend and augment. Placed at key touch-points within a customer journey they have the power to delight; to make things more seamless and efficient; and to make interactions with a brand feel more human than ever before. This isn’t just a hunch. Research shows that 73% of people prefer live chat interaction with a brand - over phone or email. It’s more natural and intuitive. And done properly, it serves the most in-demand information on-demand - freeing up customer service or marketing agents to spend more time on activities that add the most value. Gartner is quoted all over the internet as having predicted that by 2020, customers will manage 85% of their relationship with an enterprise without any human interaction. This sounds a little terrifying - but bearing in mind the information above, you can see how this can be done in a way that doesn’t compromise on human interaction, rather it will augment it. So what are the barriers that exist right now? The chatbot hype of 2017 left us all sceptical - feeling confused about what chatbots were and what businesses were trying to achieve with them. Our discussion uncovered the key questions that we’re asking ourselves as users that are still putting us off. 1. Am I speaking to a human or a robot? Bots need to be transparent about what they are. There’s little more annoying within a customer support live chat than thinking you’re talking to a human being and then 5 minutes later finding out that it was a robot. Key point: Don’t put a photograph next to your bot and call her Sally. 2. Why doesn’t this bot know what I’m thinking. . ?! For many users, understanding around what a bot actually is is very low. Because it appears to converse freely in some contexts, they assume it is like a human brain and can take in and output anything.. 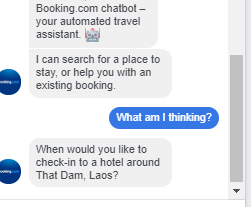 The image below is a real-life example of an angry response I got from a Marketing Executive in the travel sector, when I used booking.com’s booking bot as an example of one particular use-case for a chatbot. Our discussion group raised different perspectives on how to avoid users having these kinds of interactions. One view is that users need to be educated. The other is that a design-led approach to building a bot should lead to UX that makes use of a bot as intuitive as possible. Ultimately a mixture of these two will be the answer. Key point: Be ready for your users to push their luck. Use buttons wherever you can to offer options rather than free input. Build marketing and messaging that educates and clearly explains, alongside an intuitive experience that guides the user. Ensure your bot admits when it doesn’t understand. Build error messages that fit your brand and tone of voice - that entertain, whilst helping to get the user back on track. 3. Is everything I say being collected as data? Is it being shared? What’s it being used for? We found that almost everyone within our discussion had a fear around the data they share with a chatbot - beyond that of other digital products they use. This is partly because chatbots are dealing with someone very personal problems (personal finances and healthcare fro example). It is also to do with the fact that natrual conversation reveals much more about you and who you are than we are used to. People need businesses to be more upfront and explicit about how they are using your data. In a way you can understand. Facebook’x privacy polices are never actually read because they’re really long and packed full or jargon. It doesn’t need to be this way. Key point: Ts + Cs don’t need to be in ‘legal-ese’ to be legitimate. 1. My customers want a human connections - a bot will compromise the human interactions we have. By far the biggest concern businesses have is that integrating a bot into their customer journey will mean that they become less human as a brand. This could very well be the case if done in the wrong way. But it doesn’t need to. For instance - if a customer service team spends 70% of their time answering the same 10 questions - it often means that when something that really needs their attention comes up, they’re unable to give the fast response and dedicated time to it that they would like to. Customers expect to get fast answers to simple questions - so by allowing them to self-serve the most commonly needed information through a chatbot, they’re happier and the customer service team can focus on the opportunities to really add value. Key point: Find the areas in a customer journey where a conversational interface makes the experience better, faster, more seamless. 2. Building chatbots sound expensive, hard and risky. This can be true. But in many cases it is completely the opposite. Take our FAQ example. A little bot that qualifies your customer service queries - filtering out the questions that can be answered immediately - is simple. You might build it on Facebook Messenger using a platform like ChatFuel. It’s fast and extremely cost-efficient as it can sit on your website too. The key is to find really tangible problems to solve within your customer journey. Key point: consider bots to be augmenting and adding value to your customer journey - not replacing anything. Start small. 3. What happens when something goes wrong? Within this discussion group we had people building conversational interfaces to deal with sensitive problem areas - minor ailment diagnosis, mental health and wellbeing, as well as finance. There is a concern within these areas that if something goes wrong the implications could be quite serious. Both for the end-user and for the business. In these cases it is even more important to be clear and transparent about what the technology can and can’t do. Key point: Whether or not you’re dealing with sensitive interactions you will piss users off if things go wrong and they get the wrong information or they get stuck in the experience. Be transparent - and work carefully to ensure that you have identified potential problems or sticking points within the user experience, allowing for the conversation to be handed over to a human where necessary. Some great books to get stuck into. . . These three books came up either within our main discussion, or around it. If you have any you think we’ve all missed please comment, we’d love to know! Hannah Fry believes passionately that the we need to address our ignorance around algorithms and data. That we need to build our understanding of what AI, machine learning and complex algorithms actually are - and make active decisions about the data we are happy to share, as well as who we are happy to share it with. It is important to remember that all these technologies are created by humans. They will be as imperfect and biased as we are. Get your hands on a copy here. This is a typically super-practical guide from O’Reilly. It shows you how to design and build great conversational experiences and get started with bots that have a range of applications - from customer service through to operational efficiency. This book explores what works and what doesn't in real-world bot examples, and provides practical design patterns for your bot-building toolbox. DISCLAIMER: I love the sound of this book but I can’t for the life of me find where to get it. If anyone knows the secret please share with us. . .Here is a little synopsis from their site. . . 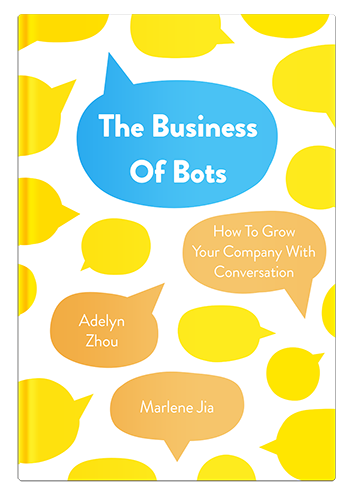 The Business of Bots profiles the top bots built on Facebook Messenger, Apple iMessage, Amazon Echo, Kik, Skype, Slack, and WeChat. They take you through hundreds of actionable bot strategies that big brands like Sephora, Tommy Hilfiger, Expedia, Barbie, Bank of America, eBay, Burberry, and CNN have used to attract, engage and retain users. There are tons of great Tools + Resources. Conversation Design Principles from Google. This is totally amazing - and not something we were even aware of! Google have understood through developing their own products, that a breadth of design expertise and knowledge is required to make really great conversational experiences. Their Conversation Design Principles offer guidance whether you’re a beginner or an experienced developer. It will even push you to question whether you are building a conversational experience for the right reasons - whether it’s really needed in the first place. Check the site out here. If you’ve been living in the startup world you’ll be familiar with the business model canvas - a template that helps you to structure thoughts around the different elements of a new business proposition. A number have been built now specifically for conversational design. There are quite a variety online so it’s worth a Google - the one below is really simple and intuitive - if a little ugly. . .
Whatever variety of conversational bot you’re building - there are a number of great platforms out there now to help you build your bot faster and better than ever before. The most extensive list I have found offers you an intro to 14 tools for building both messaging and voice bots. One that came up in our discussion, recommended by SnapOut, is RASA. This is a tool for developers - but they’ve made it simple and intuitive - so even if you’re an amateur coder it’s worth a look. Are you wondering how conversational technology could benefit your customers and your business? Our Conversational Sprints help you to quickly identify and prioritise opportunities. To find the best place to start. Before testing and prototyping ideas. If you'd like to chat about chatbots or find out more about how we work, get in touch. Imo is a Partner at Think Plan Thrive, a London based growth consultancy that works with entrepreneurial leaders in startups and big companies. We help organisations seize opportunity. Execute and grow, fast. We’re passionate about supporting individuals and teams in big companies to drive change faster. In a way that's less risky and drives positive cultural change too. Ask us anything. Book a free consult.